I had the privilege of co-hosting with Steve Butts a breakfast on April 7th with Astronaut James Lovell. The breakfast was for the UNC Morehead Planetarium, which is undertaking a major capital campaign. The Planetarium in the last few years has extended its reach so that it is touching the lives of folks, especially children, in all 100 counties of North Carolina. I still remember visiting the Planetarium as a kid, but the mission and focus of the Planetarium is so much larger now. Lovell reminds one of the actor Ralph Bellamy in his later years when he played kindly grandfather characters. He has a voice that puts you at ease and he can tell one story after another. He was not as tall as I had expected, but he said all astronauts had to be under 6’ tall since the Atlas booster rocket was only 6’ in diameter. When he became an astronaut, the Atlas boosters were anything but reliable. In any event, I thought about how astronauts and entrepreneurs are so much alike. Certainly, NASA has done much to extend many areas of science and technology, including advanced materials, computer science, big data and much, much more. But I was thinking more about how the mindset is so similar between astronauts and entrepreneurs. Both are dissatisfied in some way with the status quo and both are trying to stretch their knowledge of science or how products or services are delivered more efficiently, cheaper, faster, better, etc. In both cases, they move forward at a very rapid pace without having any certainty of the outcome. I’m constantly amazed how entrepreneurs can continue at a rapid pace even knowing that at some point they will run out of money, but always sure that the results will be there in time for them to raise the needed funds. I still have enough of a kid in me to be in awe of James Lovell. He was very impressive! I wasn’t ashamed to step up and put my hand around his shoulder and get a selfie. I know my grandkids will love it. So, I will leave you two messages. Go over and see the new Morehead Planetarium. It really is fantastic. And the next time you see your favorite entrepreneur, tell him/her to just shoot for the moon! 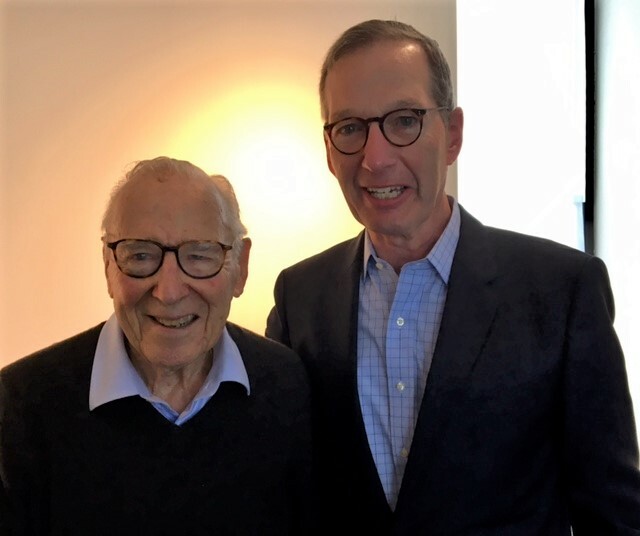 If you want to hear more about my James Lovell encounter or talk about entrepreneurship in general, feel free to comment below, email me or connect with me on LinkedIn. Fred- What a treat for you! Thank you for sharing your impressions in meeting James Lovell. Appreciate the awe in talking with this great astronaut! Enjoyed your comparison for similarity between us and astronauts, and I'll add that I see their courage and tolerance for risk well beyond most. I've had the honor of working with astronauts through NASA National Space Biomedical Research Institute, where I recommended/funded products for space as well as earth application. Cannot tell you how many astronauts noted the long Mission to Mars as a dream voyage for them. This included those "aged out" of the possibility. I find this to be an amazing bucket list item- meant for the most courageous of us. I'm adding the new Morehead Planetarium to my short list. Thanks for recommendation! NancyZ.